I have also added a Google Map showing the location of Abenójar, Spain which can be found below the free street map. I will be making this map clickable so you can zoom in and out and add a marker to your location, place of business etc. Please note that the above information on Abenójar is to be used as a guide only. If you notice any errors in the map or the population of Abenójar is incorrect then please contact us. The Abenójar Map is CC-BY_SA 2.0 OpenStreetMap, it can be downloaded for free. Want to add this small map showing the location of Abenójar in Spain on your website, in a forum etc etc? Just copy the code below and paste it to where you want the map to show. Click on the to download this map, this can also be done in full screen if you want a bigger map of Abenójar. Click on to change layers between this map, a map box street map, Google hybrid map or a satellite view of Abenójar. You can use the map you download to add to your website, facebook page or however you like excluding the Google and Bing satellite maps as they are not creative commons licenced. An example of the map file is shown below. 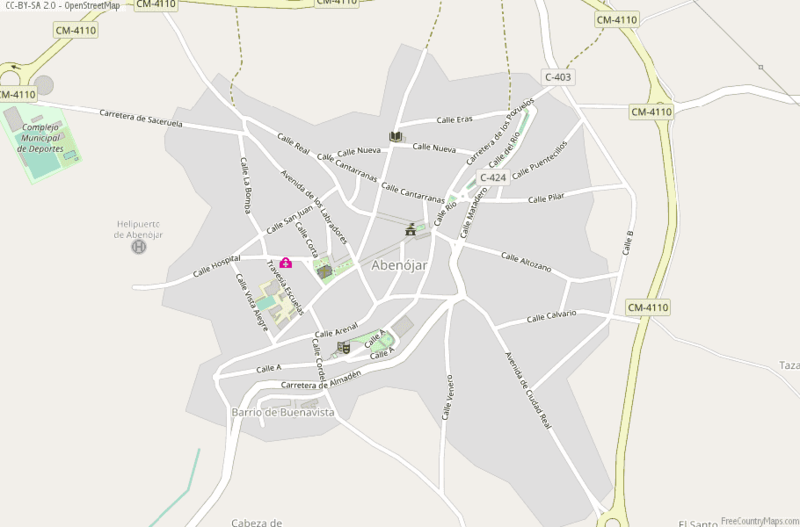 Detailed street map of Abenójar, spain. Feel free to download this map for use on personal websites with a link back to either this page or the index page. The top map of Abenójar, Spain has been reproduced thanks to Open Street Map and is licenced under The Open Database License (ODbL), so you can download this map and modify all others that contain the CC-BY-SA 2.0 watermark and your reproduced map of Abenójar must also free. You cannot download and use on other sites the country maps or any other map that doesn't contain that watermark and no map can be hotlinked. Abenójar is located in Spain, Europe within the municipality of Abenójar. Abenójar is located at the latitude of 38.879494 and the longitude of -4.355702. Abenójar has a population of around 1449 people. Providing free maps. We can also provide latitude and longitude information on towns, cities, places of interest and in some cases streets for most countries. Germany Created a database containing 81563 cities, towns and hamlets. France Built a map of France containing major cities, towns and road networks.